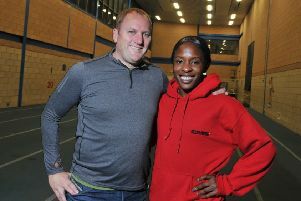 Olympic medallist Marilyn Okoro has relocated from London to Wigan in a bid to put her international career back on track. And the 800m ace says she couldn’t be happier since making the move north. “It’s been fantastic,” said Okoro. “I’ve had quite an unstable lifestyle, I’ve moved a lot in my 34 years. This was the easiest. The move came about after a chance meeting with Wigan’s Jenny Meadows – one of Okoro’s biggest rivals not long ago – at a big sports day in London in the summer. At the time, Okoro had returned from five years in America and had taken a break from athletics to overcome long-standing injuries which plagued her over the last few years. “We bumped into each other and Jenny asked me if I was still running,” she recalled. “It was a bit of a sore subject, because I wasn’t, I was really demotivated. “I told her I didn’t know what I was doing, it had been such an uphill struggle – every time I felt I was getting out of the volcano, it blew up in my face. So I told her I was really disillusioned. I knew I wasn’t done, but I didn’t know where to go from here. “I could hear her brain ticking over, and she said, ‘I’m in London on July 25, are you free to meet up?’. And then the topic came around to relocating to Wigan to work with her and her husband, and coach, Trevor Painter. “We talked around it for ages. I was like, ‘Yes I’ll come work with you? Do you want me to work with you?’” she smiled. And so Okoro moved out of her cousin’s home, packed her belongings into a pick-up truck and made the 200-mile trip north. Initially she lived with Meadows and Painter in their Abram home as she hunted an apartment of her own. 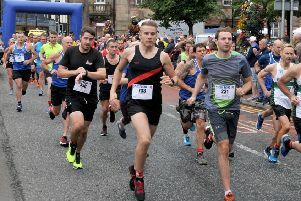 The unison may have raised eyebrows among some of those who followed Meadows’ career, given how strong her rivalry with Okoro was –they were the country’s two premier 800m runners for several years. “I don’t use the word enemies but I wanted what she wanted, and vice versa – we respected each other,” said Okoro, who went on to list their similarities. “She was super competitive, I was the same. We were both sprinters first, we both got medal upgrades... we both suffered because of doping scandals. “But the main thing I admired about Jen was that she and Trevor were a unit, a team. It didn’t matter what British Athletics or UKA said, all the criticism and hurdles, they faced together. I look at Tony (Minichiello) and Jessica Ennis, and Trevor and Jenny, they were a united front. Okoro was part of the women’s 4x400m relay team who were promoted from fifth to bronze at the 2008 Olympic Games in Beijing after the second and fourth place teams were disqualified for doping violations. In July, Okoro got to wear her Olympic medal for the first time after being presented with her bronze gong – nearly 10 years on. Championships in 2011 and the IAAF World Athletics Final in 2007 and 2008 – the year she clocked an 800m best of 1:58.45, which puts her sixth on the UK all-time list. But her career has been plagued with setbacks and injuries and after missing out on the Olympic Games in 2012, Okoro moved to Florida before returning last year. “The American dream turned into a bit of a nightmare because I didn’t have the support,” she reflected. “When I came back, I knew I didn’t want to leave the sport, because I love it so much, and I didn’t want to go with a bitter taste in my mouth. I knew I hadn’t fulfilled my potential. And she believes she has found that in Wigan, where she trains at Robin Park as well as the “beautiful” surrounding areas. “I love Up Holland!” she said. “I mean who wants to run up a steep hill? But I do, because it’s so beautiful. “Haigh Hall is my favourite place, it’s like a rainforest in there. I’ve been introduced to Rivington, and Formby dunes – everywhere we train is beautiful. She credits Shockwave treatment for solving an Achilles problem and, having completed 11 weeks under Painter’s guidance, her confidence has swelled that she can reach the Tokyo Games in 2020. “For the next two years I’m not putting too much pressure on myself, although the main goal is to make the team for the Olympics,” she said.